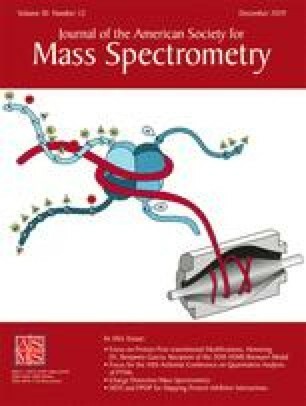 An H/D exchange- and MALDI mass spectrometry-based screening assay was applied to search for novel ligands that bind to cyclophilin A, a potential therapeutic and diagnostic target in lung cancer. The assay is based on stability of unpurified proteins from rates of H/D exchange (SUPREX), which exploits the H/D exchange properties of amide protons to measure the increase in a protein’s thermodynamic stability upon ligand binding in solution. The current study evaluates the throughput and efficiency with which 880 potential ligands from the Prestwick Chemical Library (Illkirch, France) could be screened for binding to cyclophilin A. Screening was performed at a rate of 3 min/ligand using a conventional MALDI mass spectrometer. False positive and false negative rates, based on a set of control data, were as low as 0% and 9%, respectively. Based on the 880-member library screening, a false positive rate of 0% was observed when a two-tier selection strategy was implemented. Although novel ligands for cyclophilin A were not discovered, cyclosporin A, a known ligand to CypA and a blind control in the library, was identified as a hit. We also describe a new strategy to eliminate some of the complications related to back exchange that can arise in screening applications of SUPREX.